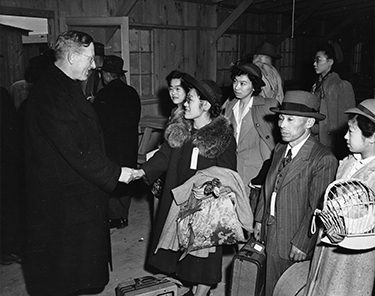 A priest says farewell as Japanese Americans board a train at the Puyallup assembly center. Photo by Howard Clifford, courtesy of UW Libraries, Special Collections, #UW 8676. The assignment was straightforward, but it felt like mission impossible: Find out what happened to more than 400 students forced to leave the University of Washington when the federal government incarcerated Japanese Americans in 1942. The World War II “evacuation” of the West Coast (more about that term in a minute) has always been a fascinating subject for me. How could the United States government imprison its own citizens behind barbed wire in camps? While at the time authorities called it a “military necessity,” it had always seemed to me one of the most shameful episodes in 20th-century American history. I was somewhat surprised to learn that students, faculty, and administrators at the University of Washington felt the same way—in 1942. Digging through material organized by University Libraries, I found Daily editorials, Congressional testimony and internal memos all denouncing the idea of internment. Thanks to research by UW Librarians Theresa Mudrock, ’81, ’88, ’90, and Glenda Pearson, ’67, ’74, the UW launched a Web site earlier this year with much of this source material. The librarians even assigned student helpers to comb through more than 8,000 names in the 1941 Student Directory, pulling out those of Japanese origin. They found 440 listings. Once I had this list, I still faced a huge barrier—it was 63 years later. How could I find former students who may have left Seattle—or the realm of the living—permanently? I had to start somewhere, so I asked our work-study students to check the 440 names against our alumni database. My hunch paid off. There were 58 matches. Once I started making calls, these former students would refer me to classmates or siblings who faced the same fate in 1942. Through good luck and a lot of phone work, I was able to contact 15 former students for this issue’s cover story. Each person’s story was compelling and inspiring. I also found that no one had reported on the efforts the UW made to protect its students. The subject was so rich that, for the first time in seven years, I convinced my publisher that we should run a two-part feature article. The result is the first installment of an untold story that will make Huskies proud of their history—and that echoes across the years to our own troubled times. Editor’s Note: Words have power, and the authorities behind the internments knew it. So they decided to mask their deeds with euphemisms. The West Coast was under “evacuation” and those affected were “evacuees.” The first internment camps—such as the absurdly named “Camp Harmony” in Puyallup—were called “assembly centers.” One Congressional committee described the process as “national defense migration.” A federal agency even invented the word “non-alien” to hide the fact that most internees were American citizens. But this was not an evacuation, it was the forced imprisonment of 70,000 American citizens whose only “crime” was their ethnic origin. (It is true that another 40,000 in the camps were not citizens of the U.S., but in most cases that was because federal law prevented Asian immigrants from becoming naturalized citizens until 1952.) Following the standards of historical scholarship on this topic, I am using terms such as “imprisonment” and “internment” in the article unless I am quoting a source that used the 1942 terminology.